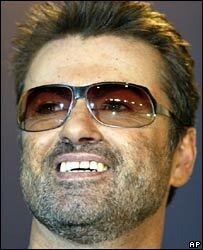 Pop star George Michael is to "marry" long-term partner Kenny Goss in a civil ceremony next year, he has revealed. The former Wham! singer said he and his partner of nearly 10 years would hold a small, private ceremony "without the whole veil and gown thing". The first civil partnership ceremonies for gay couples begin on 21 December. Referring to his own plans, the 42-year-old star said: "It'll be relatively soon after it comes in, probably early next year." As to where the singer will wed Texan Kenny Goss, 47, he added: "We'll probably do it here, not abroad." The singer was speaking after a screening of a new documentary about his career. He said he would be attending the civil partnership ceremony of singer Elton John and partner David Furnish next month. The date of 21 December has been named as the "probable" day for Elton John's ceremony. The government has predicted that up to 22,000 gay couples will take civil partnership in the first five years.